Add your favorite berries to the top for some color and a yummy taste! Add an extra cup of almond milk for a creamier texture. No almond milk? Use non-fat or 1% milk and 1½ teaspoons almond extract. Add sugar, vanilla, almond extract and cinnamon. Stir and serve warm. 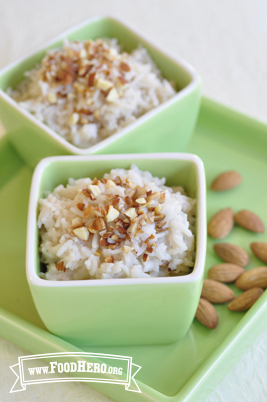 12 Comments for "Almond Rice Pudding"
I made this recipe on Saturday to sample at my food pantry. Unfortunately, the almond milk I had had "gone off" and was spoiled. Fortunately, I realized it before attempting to complete the recipe. I substituted Rice Milk, and opted to use long grain brown rice. It took nearly two hours for the brown rice to soften before I could add the other ingredients. Was this because I used Rice Milk instead of Almond Milk, or because I used brown rice, or long grain rice, or some combination? I would be grateful for feedback!Once it did thicken up, and the extracts and sugar and cinnamon were added in, it tasted pretty good, and one person who tasted it said that it would be great with cranberries. Nutmeg -- fresh grated, if possible -- would be a great addition, too! I am a Food Pantry Project Volunteer at The Shepherd's Table at St. John's in Springfield. You describe an interesting situation with several variations. The type of milk should not change the texture or cooking time. The type of rice and the actual amount of heat can change the cooking time. The proportion of rice to liquid can change the final texture. Brown rice still has the bran layer which slows down moisture reaching the interior of the grain. This lengthens the cooking time. But 2 hours seems much longer than usually needed for cooking brown rice on the stovetop. It is usually tender in 45 to 60 minutes. If rice pudding was baked in the oven, the 2 hours seems about right. To cook on the stovetop, the rice and liquid needs to come to a boil then heat is reduced to low and the pan is covered. Rice is done when the grains are tender and the liquid is absorbed. When using milk, the lower temperature also helps prevent scorching on the bottom of the pan. If you have more details of how you prepared the pudding, let us know. This is a very tasty recipe! It’s a bit thick, but could easily be thinned with more milk. We threw in a handful of raisins and ½ teaspoon of cinnamon- YUM. A great yummy and healthy dessert with calcium, whole grains, fruit and protein in the nuts. I grabbed the almond milk on sale at the store and it turns out it was already sweetened (only way you would know was by reading the second ingredient as cane juice and seeing the 15g of sugar per serving on the food label). This wasn't a problem but we didn't have to add the sugar in the ingredients list. Yes, third time's a charm. Uncooked rice. Who knew? Thanks Food Hero Team! This recipe uses uncooked rice. Third try will work with this small adjustment. Enjoy! We made this with brown rice and it was excellent! We had to simmer the brown rice longer than white, though. Very sweet treat! I tried this yesterday and it was awesome. I also added some dry fruits also. It taste so good. We are glad you enjoyed it! That is a great idea, thank you for sharing! My friend made this last Wednesday. SO GOOD! I really liked the version with low-fat milk!